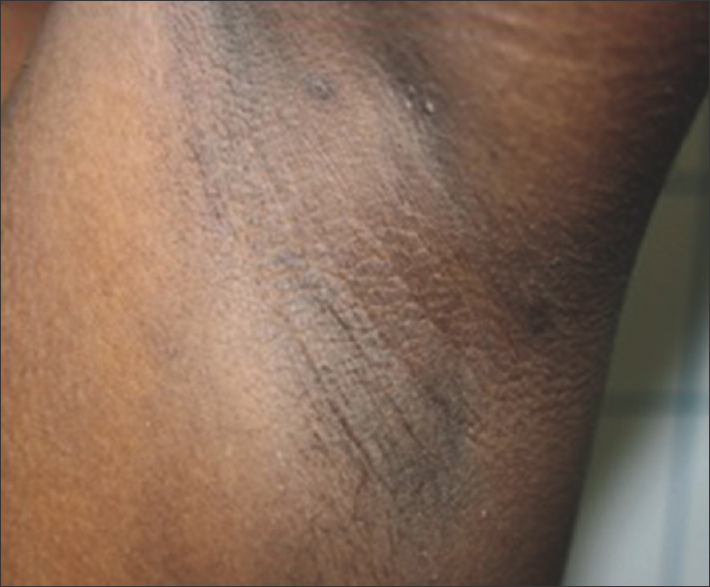 Acanthosis nigricans may rarely be associated with autoimmune diseases including systemic lupus erythematosus (SLE), thought to be due to antibodies to the insulin receptor, so-called type B insulin resistance. Acanthosis nigricans (AN) is a dermatosis characterized by velvety, papillomatous, brownish-black, hyperkeratotic plaques, typically on the intertriginous surfaces and neck. The majority (80%) of AN occurs idiopathically or in benign conditions such as endocrinopathies like diabetes mellitus, polycystic ovary syndrome; metabolic syndrome and/or heritable disease. Malignancy-associated AN is rare. AN may rarely be associated with autoimmune diseases including systemic lupus erythematosus (SLE), due to antibodies to the insulin receptor, so-called type B insulin resistance. Here we report a case of AN in a case of diffuse progressive systemic sclerosis without evidence of insulin resistance. A 40-year-old female presented to our outpatient department with complaints of dark discoloration of fingers on exposure to cold since 2 years, tightening and darkening of skin since last 1 year. The pain and dark discoloration of fingers on exposure to cold used to reverse on re-warming over 15 to 20 minutes with redness. One year back, she noted tightening of skin over face, associated progressively with difficulty in opening her mouth completely. This was followed by tightening of skin of hands, forearms, arms and feet in that order over a period of a year. The involved skin also turned progressively darker. On enquiry, she complained of difficulty in swallowing solid food and epigastric pain since 6 months. She also felt breathless while climbing stairs since 3 months. Patient noted asymptomatic darkening and thickening of skin over knuckles of both hands and feet since last 6 months, which progressively increased in severity with time. She gave no past or family history of diabetes mellitus. She had two children and her menses were regular. On examination, there was diffuse hyperpigmentation over face, both upper and lower limbs. There was tightening of skin over face, both upper limbs up to mid arm and both lower limbs up to mid thighs. On investigating, complete blood count, X-ray chest, ECG and urine microscopy were within normal limits. PFT revealed severe restrictive ventilatory defect, while barium swallow showed delayed emptying of esophagus. Serum ANA levels were raised with titers of 1:80 and anti-Scl 70 antibodies were also present. Further examination revealed rugose velvety hyperpigmentation, predominantly over knuckles and toes [Figure 1]. On examination of neck and axillae (typical sites of classical AN), similar changes of milder degree were seen [Figure 2]. This clinical picture was suggestive of predominantly acral AN. The blood sugars were normal and fasting serum insulin level was 9.2 micro unit/ml, ruling out insulin resistance as the underlying cause of AN. Serum vitamin B12 level was 304 pg/ml, within normal range. A biopsy was done from the rugose hyper-pigmentation over the knuckles. It showed epidermal hyperkeratosis, acanthosis and papillomatosis giving it a church spire appearance. The papillary dermis showed melanin incontinence with melanophages. This picture was consistent with AN [Figure 3]. Patient was treated with standard pulse regimen comprising of inj dexamethasone 100 mg daily for 3 consecutive days with inj cyclophosphamide 500 mg on second day every monthly. The lesions of AN reduced after four such pulses. According to the classification system of Schwartz, there are eight clinical types: Benign, obesity-associated, syndromic, malignancy-associated, unilateral, drug-induced, mixed-type and acral. Acral type of AN, also known as acral acanthotic anomaly, presents as velvety hyperkeratotic lesions on knee, ankle, phalangeal and tarsophalangeal joints. 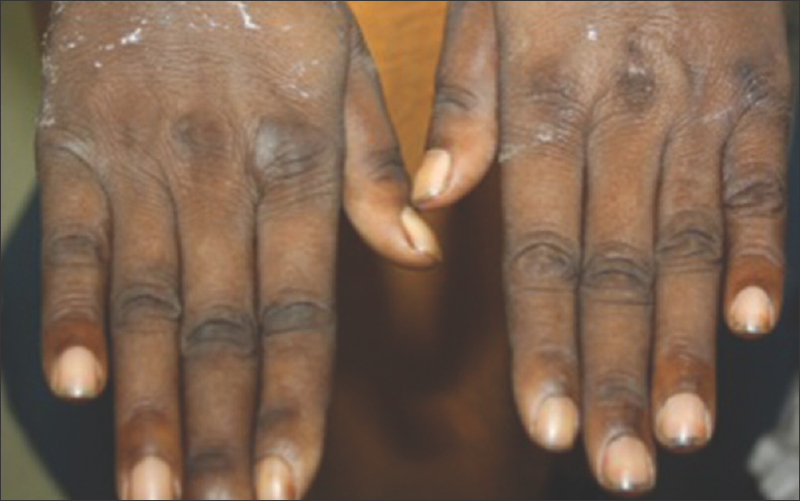 It is often characterized by hyperpigmentation on the phalangeal joints. The association of AN with autoimmune disorders like SLE and autoimmune thyroiditis complicated with type B insulin resistance have been reported. , A case of generalized AN involving an area from the mucosa of the larynx to the esophagogastric junction, accompanied by autoimmune manifestations but not type B insulin resistance, was described by Kondo et al. The association of scleroderma with AN was described way back in 1966 by Cope et al. The patient had profuse blackish villous overgrowth over axillae and inframammary regions along with diffuse systemic sclerosis. Such association has also been described by Duperrat et al. in 1955 and by Sugawara et al. in 1980. However, all these cases of AN were of the classical flexural distribution. 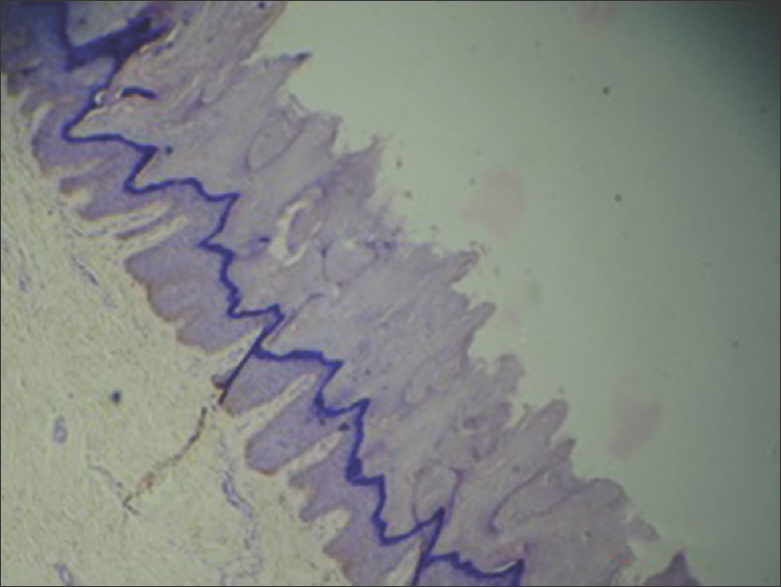 Our case is the first description of an association of acral AN with scleroderma. The precise etiology of AN has remained unclear. In general, SLE and related conditions accompanied by AN are mostly positive for anti-insulin receptor antibodies and often present with severe hyperglycemia and insulin resistance (type B insulin resistance), which might be a cause of AN-associated skin lesions. Insulin-like growth factor 1 receptor (IGFR) is expressed on the surface of human keratinocytes and fibroblasts, while excessive amounts of serum insulin interact with IGFR in peripheral tissues. Binding of insulin to IGFR promotes proliferation of fibroblasts and keratinocytes, which subsequently lead to AN. This is the proposed mechanism for development of AN like lesions in autoimmune conditions like scleroderma. However, in our case, both blood sugars and serum insulin levels were within normal limit, ruling out insulin resistance. Anti-insulin receptor antibody levels could not be measured as the patient was not affording. It is speculated that some unknown autoantibodies other than the insulin-receptor antibody might have similar effects on the generation of AN mucocutaneous lesions. Also, the improvement of the lesions on treatment with immunosuppressive therapy further implicates the role of autoimmune mechanisms in the pathogenesis. This is the first case report of the association of acral AN with diffuse systemic sclerosis without the presence of insulin resistance. Houpt KR, Ponciano D, Cruz J. Acanthosis nigricans. In: Freedberg IM, Eisen AZ, Wolff K, Austen KF, Goldsmith LA, Katz SI, editors. Fitzpatrick's Dermatology in General Medicine. Vol. 2. New York: McGraw Hill; 2003. p. 1796-801. Schwartz RA. Acanthosis nigricans. J Am Acad Dermatol 1994;31:1-22. Schwartz RA. Acral acanthotic anomaly (AAA). J Am Acad Dermatol 1981;5:345-6. Melczer N, Dvorszky C. Acanthosisnigricans bei dermatofibroma protuberans mit multiplen hautmetastasen. Hautarzt 1957;8:54-8. Song JY, Lim JH, Kim CW, Kim HO. A case of acral type acanthosis nigricans associated with lymphoma. Korean J Dermatol 2002;40:841-3. Rosenstein ED, Advani S, Reitz RE, Kramer N. The prevalence of insulin receptor antibodies in patients with systemic lupus erythematosus and related conditions. J Clin Rheumatol 2001;7:371-3. Baird JS, Johnson JL, Elliott-Mills D, Opas LM. Systemic lupus erythematosus with acanthosis nigricans, hyperpigmentation, and insulin receptor antibody. Lupus 1997;6:275-8. Kondo Y, Umegaki N, Terao M, Murota H, Kimura T, Katayama I. A case of generalized acanthosis nigricans with positive lupus erythematosus-related autoantibodies and antimicrosomal antibody: Autoimmune acanthosis nigricans? Case Rep Dermatol 2012;4:85-91. A case of scleroderma with pseudo-acanthosis nigricans-demonstrated at the Royal Postgraduate Medical School. Br Med J 1966;2:1642-5. Duperrat, Monfort. Edematous scleroderma and acanthosis nigricans. Bull Soc Fr Dermatol Syphiligr 1955;305-6. Sugawara H, Toyota T, Okuguchi F, Umezu M, Kai Y, Abe R, et al. Insulin resistant diabetes showing anti-insulin receptor autoantibody with systemic scleroderma, acanthosis nigricans and total lipodystrophy (author's transl). Nihon Naika Gakkai Zasshi 1980;69:361-9. Association of acral acanthosis nigricans and scleroderma has not been reported in literature. Insulin levels were normal in our patient, ruling out insulin resistance and antibodies to the insulin receptor as the pathogenetic mechanism.